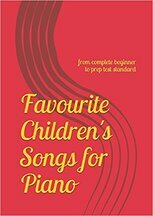 This book picks up where Favourite Children’s Songs For Piano: From Complete Beginner To Prep Test Standard leaves off! Whilst the first book in the series takes you from lesson one right through to your preparatory or initial examination, this book progresses from that point up to Grade 1 standard. Twenty-four pieces, including Do You Know The Muffin Man?, Rockabye Baby, Mary Mary Quite Contrary, This Old Man, Auld Lang Syne and many more! More Favourite Children’s Songs For Piano also includes specimen Grade 1 sight reading tests and the scales required by the major exam boards. A must have for anyone thinking of undertaking graded exams – or those just wanting to play for fun! The last four pieces in this book are of Grade 1 standard, but remember for your exam you’ll have to prepare pieces set by your chosen exam board, so check the syllabus requirements carefully. Same for the scales - you won’t need to play every scale printed here! Always check the exam requirements with your teacher. "If you teach young beginners, get this book. You will not regret it." This book contains 36 well-known and well-loved pieces I've arranged for young pianists, including nursery rhymes, children’s songs and famous classical pieces. The difficulty progresses from complete beginner to prep test standard, divided into four parts: simple tunes for one hand; melodies shared between two hands; putting hands together and prep test standard pieces. Ideal learning material for beginners, students and teachers alike will love progressing through this book. Welcome to the start of your musical journey! PDF version - £3.50. I can email you a PDF version for printing at home. Simply contact me and I'll let you know how to pay by Paypal or bank transfer. You can hear the pieces played by clicking on the mp3 files below. Downloadable PDFs of chords for teacher accompaniments and teaching notes can also be found.